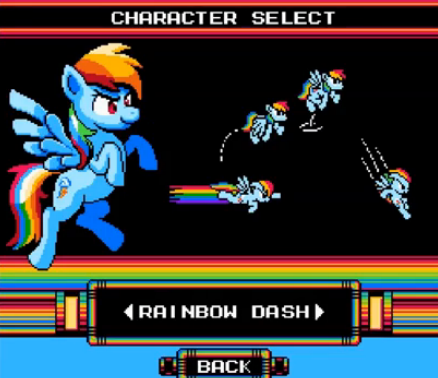 Once upon a time in a magical land called Equestria, a young game designer named Khao Mortadios set out to create a blend of little ponies and classic NES style platforming the likes of which the world hadn't seen before. And now, a little more than a year later, Megapony is ready to take the stage in earnest. No mere ROM hack, Megapony is a fully customized Megaman-inspired platformer built from the ground up using Game Maker 8. Featuring new enemies and revamped stage design from its previous iterations, the game is quite polished and provides a level of challenge fans of the classic series can sink their teeth into while still being (I'm pretty sure) accessible to newer players with less experience from the take-no-prisoners-but-instead-all-of-their-quarters style gaming from the 80s and early 90s. It's the best of both worlds! Are you mare enough to take up laser shooting horn and bring Twilight and her friends back to the light and stop the wily Doctor Discord? Time to find out! If you've been around for a while you might remember some of the previous iterations of this game. What does this have for you? A short list of improvements includes infinitely better between level art, improved and revamped level design, and of course the long-awaited Discord stages, which are appropriately and satisfyingly tricky to navigate through. Beat the game and unlock the extras, like the ability to replay the game as any of the mane six, bringing their powers to bear instead of the titular hero's. Your old saves will even still work! This game has been a long time in the making and is a definite labor of love by its creator. And that labor pays off today. If you're looking for some good pony gaming fun and challenge, then this comes with my highest recommendation. But you've heard me prattle on enough. Download the game today! Update: critical glitch with Extras playthrough as Twilight found and fixed. Download link has been changed to include the new, fixed version.